Hello SnS families, awesome day today. Started at 6:30 am with our breakfast club and we trained until 7:30. Cool morning and jackets and pants were acceptable, at least by me. After breakfast, which by the way was awesome and some of the kids asked if meals were this good in Sweden, we had 2nd session at 10-12 pm. You can see some video from the Brazilians that our SnS teams are known for. Yes, somethings never change. Lunch at 12:30 then 3rd session at 2-4 pm which was mostly tactical. Kids picking up my schemes pretty quickly. Dinner at 6pm and 4th session at 7:30-9 which was hack fest where the kids all played and just had some fun. Speaking of fun, well fun for me, had 2 girls rooms leave their rooms unlocked, which is major no no so we took most of their possessions and placed them in staff room. Upon return from training, as you can imagine, some freaked out girls. Wwell, 1000 situps later and some lessons learned the hard way, not sure if that will happen again. Also had some kids leave some gear behind at the fields and of course, they had to pay to get them back, pay in terms of sit ups. We will be buff for the beach soon. Meals have been awesome, weather ranges from 60-85 degrees, rooms good, and so far not one single player has failed in our name game, most impressive. 10 pm curfew and all are out, good sign of working hard. Friday we have 3 sessions and some down time to go to harbor and relax so that should be fun. 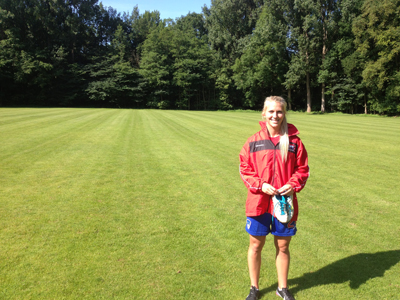 Coach Amanda on beautiful training field in Germany. Austin n Drew. Good form boys.